Barcelona, the capital of the Spanish region of Catalonia, is one of Europe’s most sophisticated metropolitan destinations. The megacity of more than four million people was founded by the ancient Romans, who called it Barcino. 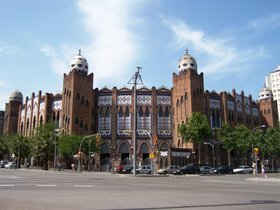 Located at the Plaza de Toros Monumental de Barcelona is informally known, is the most famous bullring in the Catalonian city of Barcelona. No list of things to do in Barcelona would be complete without a visit to La Monumental, where bullfights are no longer staged, but where visitors can get in touch with an important piece of Barcelona history and culture. This gem is unknown to many tourists who visit Barcelona but is well worth the time. La Monumental closed for bullfights in 2011, outlasting all the other active bullrings in Catalonia, La Monumental was created for two purposes. One was its function, and the other was to pay homage to the Art Nouveau movement in architecture and design. The exterior is designed in a Moorish style exemplified by thousands of colorful tiles in an intricate geometric design. La Monumental is a picturesque place to take photographs. Manuel Joaquim Raspall i Mayol designed La Monumental, which was originally christened La Plaza de Sport. The Barcelona native was one of the early 20th century’s great urban architects. Raspall i Mayol’s name is strongly linked to the Modernist, Art Nouveau (Noucentista in Catalan), and Art Deco movements. Historically, La Monumental has also been home to circus acts and concerts, with musical acts including the Beatles, Bob Marley, and the Rolling Stones playing in the arena. Bullfighting was formally banned in Catalonia in 2010, and the ban went into effect in 2012. For American fans of the novels of Ernest Hemingway, the sights of La Monumental will spark a connection with the author’s books, especially his novel “The Sun Also Rises” and his non-fiction work “Death in the Afternoon.” Hemingway’s fascination with the Spanish culture of bullfighting first introduced many Americans to the historical tradition, and his Modernist writing style aligns perfectly with the art movements that inspired La Monumental’s design. Visitors to La Monumental can walk through the stands, see the stalls were bulls were kept, and walk out into the arena. An essential part of any visit to La Monumental is a trip through the bullfighting museum kept above the stables. The artifacts in the museum are labeled in Spanish, French, German, and English for the convenience of many visitors. One of the highlights of the museum is its collection of historical bullfight posters, which are valued today for their beautiful and highly creative design, and the collection also includes bullfighting costumes that date back to the 18th century. Located at Gran Via de Les Corts Catalanes 749 where Gran Via meets Marina Street, La Monumental is only a short distance from Sagrada Família Basilica, another must-visit attraction of Catalonian architecture and history and a UNESCO World Heritage Destination. Barcelona’s Metro line with drop visitors off directly at La Monumental and admission is only six euros. One should expect to spend about an hour to an hour and a half touring La Monumental, including its museum collection. A small gift shop is located inside La Monumental. Visiting Gran Via, the longest street in Catalonia, is one of the great things to do in Barcelona. In addition to La Monumental and Sagrada Familia, its many attractions include the Noucentista Font de Diana (a monument representing the ancient Roman goddess Diana), els Encants Vells flea market – one of the oldest in all of Europe – in the Plaça de les Glòries Catalanes square, and the Plaza of the University of Barcelona. Gran Via is also known as a destination for shopping, theaters, and dining, with over 200 shops. Within a 5-kilometer radius of La Monumental, visitors will also find the Picasso Museum, Aquarium Barcelona, the magnificent 18th-century Parc de la Ciutadella (which includes the city zoo and a tropical greenhouse), and Opium, one of Barcelona’s most popular night clubs. La Monumental may not be the most popular destination for those who visit Barcelona, but the cultural treasure captures a unique snapshot of Barcelona history.